I've said it so many times here on my blog and in all my workshops! I go out daily without the need of foundation as long as I have a good concealer and a face powder to set! That said, I have finished so many brands and types of concealers over a decade and there are just a few that I can say --- really works! 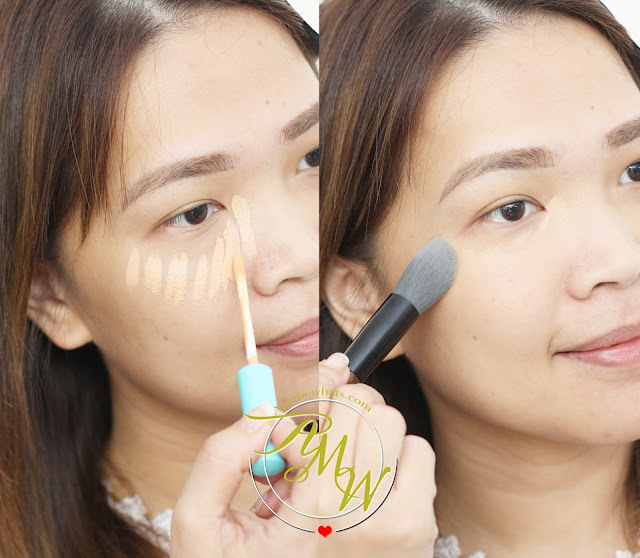 When I got myself Happy Skin Bye Bye, Blues Brightening Concealer Wand during the Festival of Colors Collection Launch, I wasn't that impressed with the capacity of a concealer to "brighten" at the same time cover undereye darkness! I mean, you can choose only ONE right? Either a concealer can "correct" your undereye circles or acts as an undereye "highlighter" to brighten the area.... multiple choice question...choose only ONE. But with Happy Skin, I can finally say, there is an option 3 --- ALL OF THE ABOVE! The Bye Bye, Blues concealer comes in 2 shades --- Light and Medium. As always, I go with my gut-feel and went for "Medium" even if my fellow Beauty Bloggers would probably raise their eyebrows on me! But yes, I need a medium because that is HOW DARK my undereye circles are! Like ANY concealer, my favorite packaging for liquid type concealer will always be the "tube" type with a doe-foot wand applicator! This, my friend, in my humble opinion is the best packaging for any Liquid Concealer! Medium may look a bit too dark for those with fair skin but again, the reason why I chose this shade is for the fact that this particular concealer has more "warmth" to it, it has more "peach/salmon" undertone that the LIGHT shade which would work perfectly for the darkness of my undereye area. AMW TIP: In choosing undereye concealers, you do not only "match" the concealer to your skin tone, you have to check on the "intensity" of darkness the undereye area is. The darker the area, the more "peach/salmon/orange" pigment you need in a concealer. According to instructions, you need to apply "generously" all over the undereye area, as for me, since I have dry patches underneath the area, I prefer to apply a generous amount of "SMALL DOTS" as shown on photo below using the wand. Because I needed "all the coverage" I can with this particular concealer, I picked a synthetic brush in gently sweeping off the foundation doing both short "sweeping" and "dabbing" motion at the same time. Of course, there's always a STEP 2 for those who lacks sleep like I do! Let the first layer sit for a couple of minutes, check back your reflection and aim for 2nd layer (if you need more coverage like I do). In my case, applying thin layer at a time will lessen the chance of creasing or setting into fine lines. This time, I like to "brighten" up the rest of the undereye area by applying generously below the undereye circles (as shown on photo below). Trying not to "touch" the "eyebag" area, I apply generously and gently blend out with quick, downward strokes. 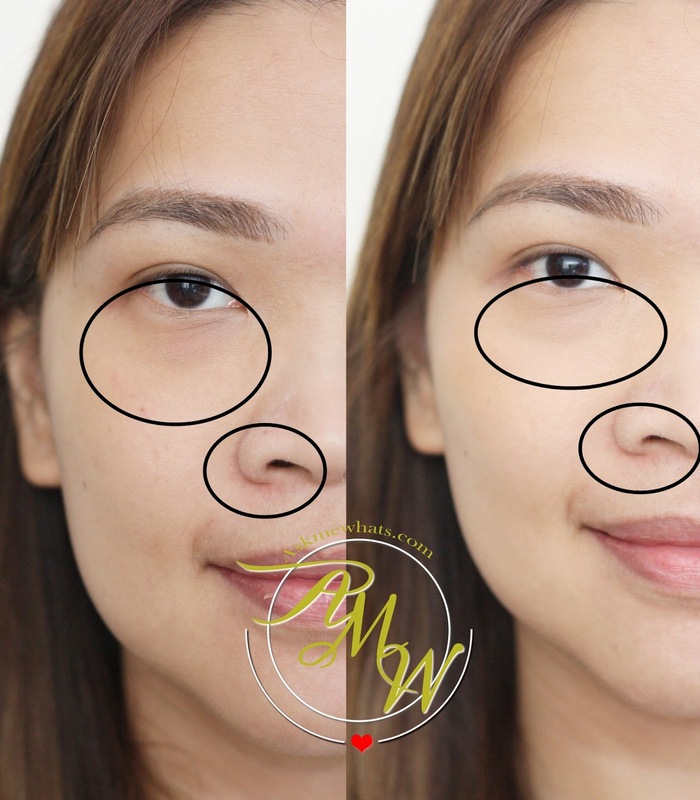 A diagram to show you the areas that were covered by Happy Skin Bye Bye Blues Brightening Concealer. I also like to use this particular concealer to cover the redness on the sides of my nose. See how natural the result is? Concealer is packaged in a very easy-to-use packaging I can apply concealer even on-the-go. Coverage is medium to heavy. Can cover up dark undereye circles and brighten the area. The concealer applies like a dream and feels velvety. Does not crease the undereye area even for users like me who suffers from dry patches. If you have very dry skin, it may sit into fine lines and wrinkles, you have to use hydrating eye cream prior to concealer application and set properly. Concealer stays the whole day. 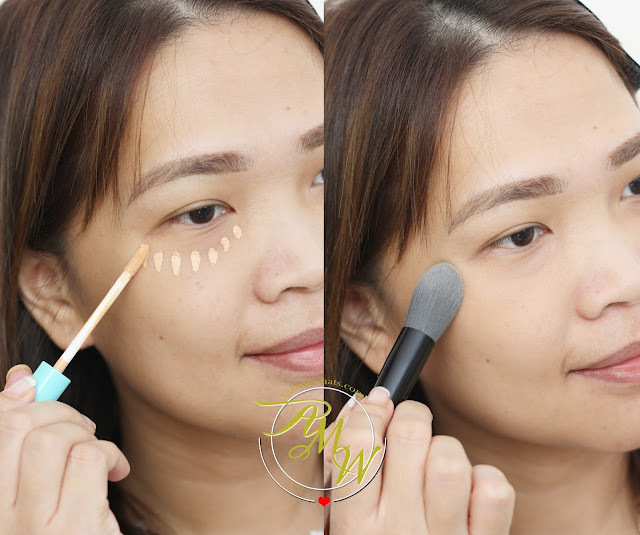 Happy Skin Bye Bye, Blues Brightening Concealer Wand is priced at Php899.00. For more information, visit www.happyskincosmetics.com. Follow them on Instagram @Happyskin_PH and Like them on Facebook. (www.facebook.com/happyskincosmetics). How do you like the coverage of Happy Skin Bye Bye Blues Brightening Concealer on me? Have you found the perfect undereye concealer/brightener for you? I think I found mine! Will definitely repurchase! I do think it really makes a nice everyday staple---for those times you don't have the time to do a full makeup. I can't actually remember the time I have worn a foundation since I found the Maybelline BB stick. It's all I need and their classic face powder. Foundations break me out horribly, sad to say. Sinabi mo, I've been reaching out for this na! Aawww , there must be certain ingredients on your foundation that breaks you out! Found out which one na ba? Whoa that looks awesome though for me, I never look for other concealer since I got the zero kuma. wow,g lad Zero Kuma works for you! High coverage pa! Yeah my bags have a hard time showing up. Lol! super nice na bagay sayo, what's your backup? or 2nd option?